Better Buy: Welltower Inc. vs HCP, Inc. 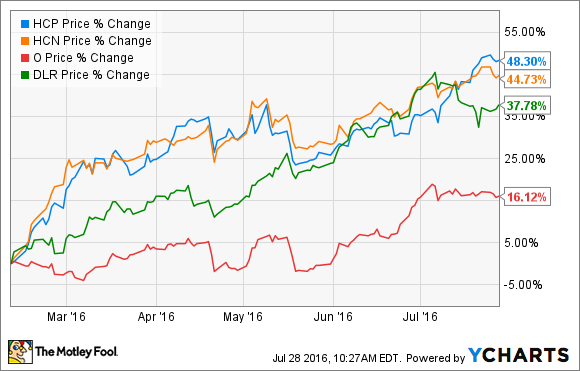 Which of these two leading healthcare REITs is the best buy now? I've compared these two sector-leading healthcare REITs before, but things have changed recently. Specifically, REITs have performed wonderfully, and these two in particular have done extremely well. In fact, Welltower (NYSE:WELL) just hit a fresh 52-week high as I was writing this, and HCP (NYSE:HCP) has completely erased the losses it suffered earlier this year when it posted a surprise loss. Here's a refreshed look at these two stocks, the REIT market in general, and which is the better buy now. Why have REITs been soaring lately? There are a few possible reasons for this. Mainly, it looks like the low-interest environment will stick around for longer than anyone originally thought. This helps REITs in a few ways. It makes borrowing money cheaper, which generally leads to higher profit margins when REITs acquire new properties. It also makes REITs more appealing to investors, since the dividends they offer put most bond yields to shame, and offer upside potential. Another reason is the recent market volatility, both to the upside and downside. REITs typically have relatively consistent income streams, and in uncertain times, consistency is an investors' best friend. For a thorough look at Welltower and healthcare real estate in general, check out this other article I wrote, but in a nutshell, Welltower mainly invests in senior housing and long-term care facilities. The business model is to acquire properties that are better than those offered by competitors, and partner with some of the best operators in the business. And, it's been a successful business model. Throughout its 45-year history, Welltower has done an impressive job of producing excellent returns for investors: It has averaged a 15.6% total return and has increased its dividend at an annualized rate of 5.7%. HCP has a similar business model, but with more exposure to post-acute and skilled nursing properties, primarily through its portfolio of HCR ManorCare assets. Those assets have run into some trouble recently, causing an unexpected loss in the fourth quarter of 2015, and HCP has decided to spin them off into a newly created REIT during the second half of 2016. As far as healthcare real estate in general goes, there are some good reasons to hold it as a long-term investment. For starters, the U.S. population is aging -- fast. In fact, the 65-plus population is expected to roughly double by 2050, and the older age groups such as 85 and above are expected to grow even faster. Image source: HCP investor presentation. In addition, healthcare costs have been increasing at a faster rate than inflation, and the market is highly fragmented, which means there are plenty of opportunities for these companies to grow. As I've mentioned a few times, both of these REITs have performed well over the last few months. In fact, Welltower and HCP's stock prices have risen by 17% and 22% respectively, since I first compared the companies in March of this year. Plus, HCP has increased its 2016 funds from operations (FFO) guidance since that time. Therefore, it's a good idea to take another look at both companies' valuation. Data source: Company financials. Adjusted or normalized FFO projections are used when available. There are a couple of points to be aware of here. First, both companies have gotten considerably more expensive than they were just four months ago, although I still wouldn't call these valuations high. For comparison, popular retail REIT Realty Income trades for 24.3 times 2016 FFO, and apartment REIT Equity Residential trades for a multiple of 21.4. The difference is mainly because of the (correctly) perceived risk involved with senior housing properties, given that the industry as a whole has experienced some financial difficulties lately. Also, at first glance it appears that HCP is significantly cheaper than Welltower. However, bear in mind that HCP has experienced more earnings volatility than Welltower in recent history as a result of its troubled HCR ManorCare portfolio. Plus, there is some level of uncertainty involved with the upcoming spinoff. Simply put, the difference in valuation is somewhat justified. One thing is for sure: Both of these REITs have gotten considerably more expensive recently. Neither one of these stocks is the bargain it was just a few months ago. Having said that, neither one seems particularly expensive, either. Although I own both in my retirement account and plan to hang on for decades to come, I lean toward HCP at the present time. I think the spinoff of the troubled HCR ManorCare assets will create profit opportunities, both for the remaining HCP assets and for the newly created REIT. There will undoubtedly be some growing pains, but for investors with a long time horizon, I believe HCP will deliver excellent returns over the years.